Reflective big glass diamond trim add a touch of glamor to the gray finish frame of this rectangular wall mirror. Add an elegant touch of intrigue to a bare wall space with this rectangular wall mirror. A gorgeous gray finish washes over the crisp rectangular frame of this mirror, that is beautifully decorated with big glass diamonds. 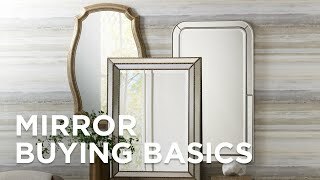 This mirror can conveniently be installed vertically or horizontally. 32 1/4" wide x 40 1/4" high x 1 1/2" deep. Glass only section is 20 1/4" wide x 28" high. Surrounding frame is 5 3/4" wide. Rectangular wall mirror from the Noble Park Pari Mirror collection. Gray finish. Big glass diamond trim.